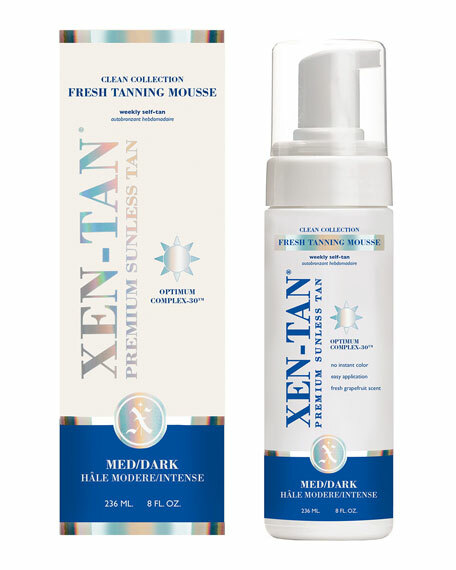 Xen-Tan Fresh Tanning Mousse, 8 oz. Xen-TanFresh Tanning Mousse, 8 oz. Created for those of us that want to feel and smell fresh all the time, our hydrating colorless mousse develops into XEN-TAN's trademark olive tone tan in 3-4 hours with added skincare benefits. The smooth texture and light grapefruit scent give first time tanners the ability to feel comfortable using our FRESH TANNING MOUSSE. With one of the biggest breakthroughs in self-tan performance, Optimum Complex, XEN-TAN's DHA/Melanin complex works with your own pigment as well as our time-release ingredient to give you a rich, enviable color and longer wearing self-tan. Apply one coat for a perfect medium shade or two coats for a deep luxurious shade that is perfect for both men and women. Your skin receives mush needed hydration from peptides, green tea, ginkgo biloba, aloe vera and vitamins D & E.
For in-store inquiries, use sku #1529301.